Home Tags Posts tagged with "vnezuela crisis"
Venezuela’s new constituent assembly has overwhelmingly voted in favor of assuming the powers of the opposition-led parliament. However, parliament has rejected the move. President Nicolas Maduro says the new assembly will end political unrest, but many say it is a slide towards dictatorship. Meanwhile Colombia says Venezuela’s chief prosecutor Luisa Ortega Diaz has arrived in the capital Bogota. Luisa Ortega Diaz said she feared for her life after being dismissed by the controversial assembly. Once a staunch supporter of Nicolas Maduro, Luisa Ortega had become a strong critic of the president’s socialist government in recent months. The former chief prosecutor’s whereabouts had been unknown following her dismissal on August 5. On August 18, Luisa Ortega told a regional conference via videolink that she had evidence that President Maduro was embroiled in a corruption scandal involving the Brazilian construction company, Odebrecht. Odebrecht has admitted paying bribes to win contracts in 12 countries, though no Venezuelans have been named. Venezuela Crisis: The Impact of Civil War? Venezuela’s parliament said citizens and the international community would not recognize the constituent assembly’s new powers. The head of the Organization of American States (OAS) Luis Almagro called the move an “illegitimate dissolution” of the elected parliament. Regional economic bloc Mercosur – which includes the region’s two biggest economies Brazil and Argentina – also condemned the move. Earlier this month, Mercosur suspended Venezuela indefinitely, urging President Maduro to release prisoners and begin a political transition. The heads of Venezuela’s opposition-controlled parliament and the new assembly have been trading insults on social media. 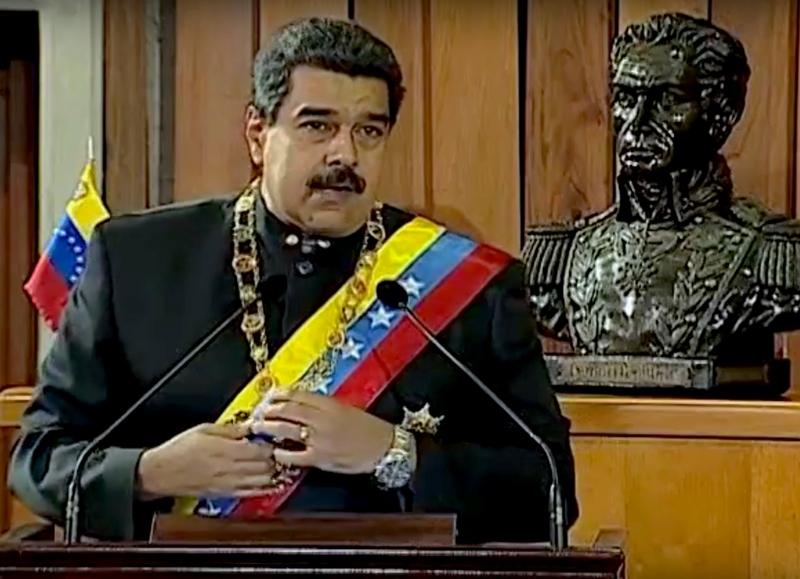 Parliament head Julio Borges accused the constituent assembly of a “coup” while new assembly head Delcy Rodriguez – a close ally of President Maduro – denounced his “lies”. President Maduro’s wife and son are among the 545 members of the new assembly, which was set up following a controversial election earlier this month. More than 120 people have been killed in Venezuela’s violent protests since April. Nicolas Maduro’s opponents want to hold a vote to remove him, blaming his left-wing administration for food shortages and soaring inflation in the oil-rich country. Constituent assemblies are set up for the specific purpose of drafting or adopting a constitution, and as such can fundamentally change how a country is run. Venezuela has seen waves of violent protests, and President Maduro presented the assembly as a way of promoting “reconciliation and peace”. The election for the constituent assembly was marred by violence and accusations of fraud. Venezuela’s electoral authorities said more than eight million people, or 41.5% of the electorate, had voted, a figure the company that provided the voting system said was inflated. The opposition boycotted the poll and also held an unofficial referendum in which they said more than seven million Venezuelans voted against the constituent assembly. The US has imposed sanctions on Presidnet Maduro, with the Trump administration calling him a “dictator”. The EU and major Latin American nations say they will not recognize the new body. Nicolas Maduro retains a major ally in Russia, however, and has the support of several left-wing nations in the Americas.